First time at Braun’s! A typical bar, but with a super-nice stage setup outside, with a temporary/permanent shell over it. Turned out to be a great place to see a show. Unfortunately the turnout wasn’t all that great; not sure if it was the location that turned people off, or if there just isn’t that big of a Nonpoint following in WNY. In any event, the locals up first were okay, but I spent way more time talking to Danielle and Dave. Danielle had come in from CT for this show and the one the next night in Syracuse to see Love and Death (Head from Korn’s other band), who were supposed to be direct support, but dropped off the tour. But regardless, it was fun to catch up and re-hash old shows with them. 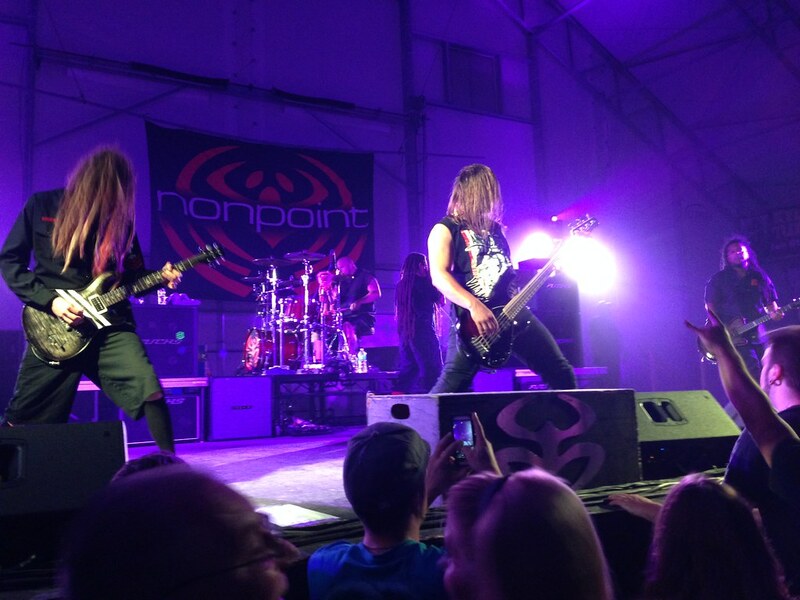 Before long, it was Nonpoint time! As if seeing them again (first time since Syracuse in 2010!) wasn’t good enough, the other neat thing about this go around was that I got to see my favorite hired-gun guitarist again: BC Kochmit! After the apparent demise of Eye Empire, BC had been filling in with Nonpoint as one of their guitar players had a baby (BC’s now in Nonpoint permanently!) and this was one of the dates he played. Rocking my Eye Empire shirt, I was able to get down right in front of BC and have a little repartee throughout the night. Good times. So despite the smallish crowd, we had a blast. The set was decidedly old-school, with 7 of the 13 tunes coming off the first two albums. We also got the first live performance of the new lead single “Breaking Skin” which is a killer tune as well. They sounded great, BC fit right in, Elias kept the crowd hyped, and I personally was a jumping fool down front, especially for my favorites off the first album (Victim, What a Day, Endure). I’m always torn on low turnout shows, because part of me wants a big crowd for the band (so they come back! ), but I also love the “they’re playing in my backyard for me and my friends” vibe as well where only the die-hards come out and it’s super intimate.